Farmers in Karnataka went on the rampage over the shortage of fertilisers, which has put their kharif crop at risk. Call it a quirk of fate. When B.S. Yeddyurappa took oath as the Chief Minister of Karnataka’s first BJP government on May 30, 2008, he did so in the name of the farmer. He knew he owed his present position to him. The first decision of his Cabinet was also seen as pro-farmer: the government announced that it would not charge them for the electricity sold to power irrigation pumpsets. However, a few days later, when his police opened fire to control a mob of violent protestors, the first victim, Siddalingappa Choori (35), was a farmer. Several others were wounded. 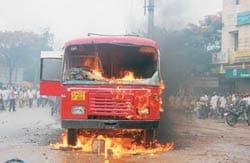 The incident occurred at Haveri, 350 km away from Bangalore, on June 10, 2008. The trigger? A protest by farmers, who were demanding supply of fertilisers, diammonium phosphate (DAP), in particular. The farmers were agitated as the region had been receiving copious rainfall since June 3, but they were unable to start sowing for want of DAP. Though the fertiliser shortage was felt across Karnataka, the nondescript Haveri turned out to be the epicentre of violence. That is because the southwest monsoon arrived here first and if DAP was not applied and seeds not sown immediately, farmers could forget about raising kharif crops. “Our soil is used to chemical fertilisers, and unless they are used now, I can’t get a crop,” rues Yellappa Malagi (65), who owns 50 acres on which he had planned to sow cash crops like cotton and soyabean. Not a single shop—of the 38 government-run outlets, or 225 private stores across the district—dared to open and sell whatever little stocks they had during the days of and for their lives as well. In places like Hassan, represented in the Lok Sabha by former Prime Minister H.D. 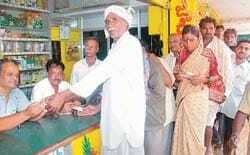 Deve Gowda, shopkeepers simply locked up their shops and vanished from the district. In the twin cities of Hubli-Dharwad, rioters broke open some shops and took away bags of fertiliser. Incidentally, only 3,821 metric tons (MT) of DAP was available in Karnataka on April 1, 2008 against 52,962 MT on the same day last year. Similarly, the stocks of muriate of potash (MoP) and complex fertilisers were much lower compared to last year. The Haveri District Administration is clueless about how to deal with the situation. “Haveri has never had a problem of this kind,” says District Magistrate P.S. Vastrad. The administration is using all the tricks in its book to tackle the problem. One of these is to issue two bags of 50 kg each per head, on arrival of each DAP load. As a mark of identification, farmers receive a dot of indelible ink on their finger so that they do not stake claim to the precious bags again. Farmers like Malagi put forth a valid point, though—two bags of DAP is barely enough for one acre. Karnataka’s Water Resources Minister Basavaraj Bommai, who hails from Haveri district, sees a bigger crisis developing, which has implications beyond Karnataka. He says fertiliser units are not producing enough as the Centre is not releasing their dues on time. He predicts a similar tense situation in other states once the rains start. Maharashtra’s Latur has already witnessed protests over fertilisers, while Punjab, Tamil Nadu and Kerala have reported shortages. Gujarat wants 50 per cent of its requirement supplied before the sowing season begins. Sample these numbers: India not only imports 30 per cent of its fertiliser requirements, but buys inputs such as phosphorus acid and ammonia from international markets, where prices are rallying to an all-time high. Take for instance, phosphorous acid: it cost $566.25 (Rs 22,650) per tonne last year but is now quoting at around $1,985 (Rs 79,400). While prices of most inputs have doubled, the Centre is sticking to the same old Maximum Retail Price (MRP), fixed some six years ago. It, however, pays the fertiliser units the difference between MRP and the actual cost of production, plus a reasonable return. The fertiliser MRP does not reflect actual costs, a la auto fuels. As a result, the subsidy bill is ballooning unfettered— from Rs 48,000 crore in 2007-08, to an estimated Rs 1 lakh crore in 2008-09. The increasing subsidy bill is the least of the worries of fertiliser firms, numbering about 133; the timely release of subsidy dues is. A senior industry executive says even if fertiliser companies want to produce as per market demand, they can’t because of the spiralling input prices. While this has dented the ability of the manufacturers to shop for inputs, they have often overshot their credit limits with banks and can’t raise fresh loans till they have cleared past debts. Both the Fertiliser Association of India (FAI) and the Department of Fertilisers insist that the fertiliser supply position is normal. Joint Secretary, Fertilisers, Government of India, Satish Chandra, ascribes the panic in Karnataka to the early onset of monsoon. “June has never seen this kind of sales. Last year, it was just 50,000 MT, but this year even 1.4 lakh MT have not been enough,” he says, adding that sufficient stock has been dispatched to meet the demand. FAI Director General Satish Chander says the industry is producing 10 per cent more, and that should take care of incremental demand. However, some estimates put the fertiliser shortage at 25 per cent and that could lead to a fall in agricultural output—not a comforting scenario in these times of rising food prices.